uStoreLocator for Magento 2 provides your customers with convenient navigation on the store locations map due to its integration with the latest version of Google Maps API V3. It allows frontend users to quickly find your offline sites of various types and get additional information on each location. With the module, you provide your customers with the ability to search for a store location by multiple parameters. This way, a website visitor can enter an exact address, country, region, zip code, etc. in the search box, as well as look for a specific landmark. It is also possible to select a radius to perform a search within a particular distance. Depending on the admin configuration, the search results will be displayed in alphabetical order or sorted by geo position. Various options of looking for a necessary shop provides customers with a better experience when browsing on your website. Store owners can create any number of offline locations depending on the scope of their business and add the description to each of them. You can specify a name, store view, country, contact details, and any other important data when creating a store location in the backend. Thus, you provide your customers with extensive information on each offline shop. Moreover, your website visitors can switch between the default street map view and satellite view, just like in Google Maps. Also, it is possible to zoom in and out on the map for more convenient navigation. 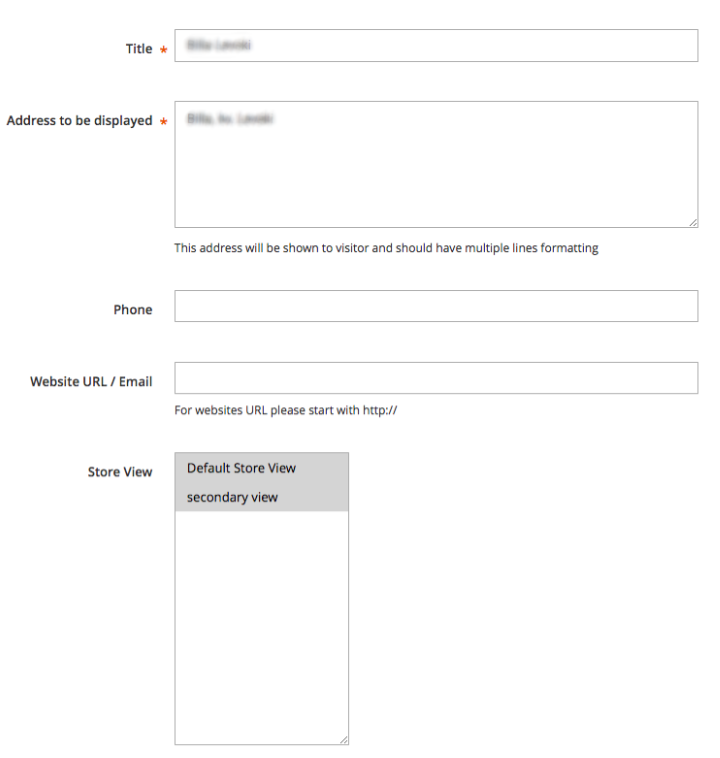 From the admin perspective, the Magento 2 uStoreLocator extension offers flexible settings and customization options to set the map display according to specific needs. Store admins can adjust the look and style of the store locator by using CSS and changing user interface settings. Besides, you can set the precise location of an offline shop by manually entering its geographical coordinates. Also, it is possible to feature selected store locations to make them highlighted and place at the top of the search results. Moreover, Magento admins can set an initial map zoom of each location for the frontend display. Another customization option allows replacing default Google markers with custom map icons. For example, you can add a brand logo or another distinctive image to make it easier for online shoppers to find a specific location. Also, website owners can decide on the location types to be displayed on the frontend by specifying location tags. Each tag is related to particular categories or products on your store, which allows customers to quickly filter the search results. Besides, you can provide your website visitors with clear step-by-step directions to help them understand how to get from their geo position to your shop. 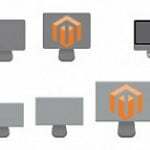 Note that in addition to manual creation of store locations in the Magento Admin, it is possible to import a CSV file with existing locations to the system. Note that before configuring the uStoreLocator extension, you need to apply for your Google account to be able to use Google Maps. We will start exploring the backend configuration of the module from its general settings. All settings are located under Stores -> Settings -> Configuration -> General -> Store Locations. 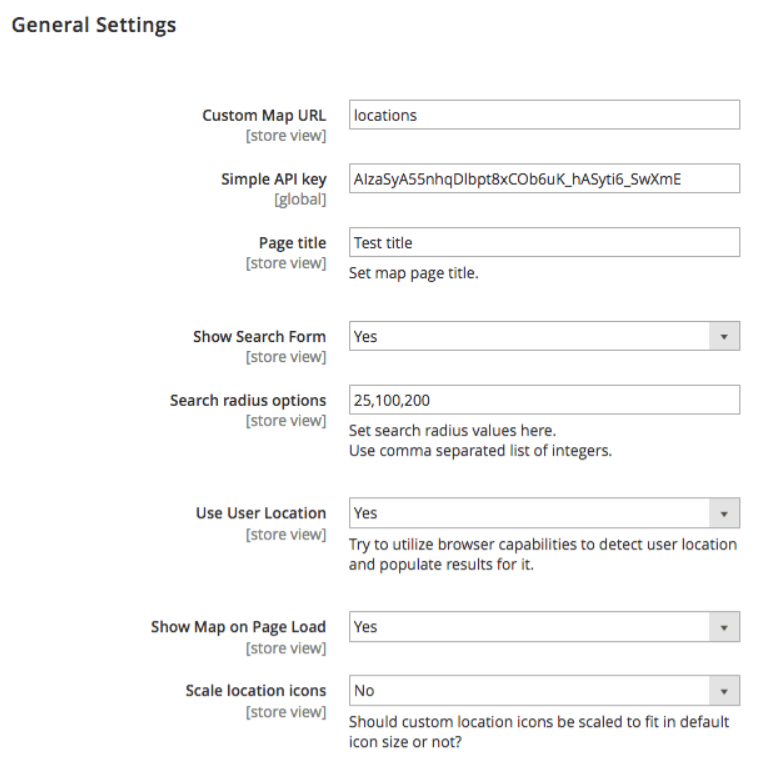 In Custom Map URL, you can change a default map URL and make it more SEO friendly. Then, insert an API key from your Google account and create a title for the map page. Next, enable/disable the search form display and specify values for search radius options available on the frontend. Here, you also enable/disable the following functions: auto-detection of user location, map load on the page opening, and scaling custom icons to the Google default icon size. Next, decide whether you want to show an address on the map based on geolocation, choose a default address from your created locations, and select a value for the minimum zoom. In the following fields, choose a sort order for the search results display (Alphabetically (by name) or By Distance) and its type (ascending or descending). 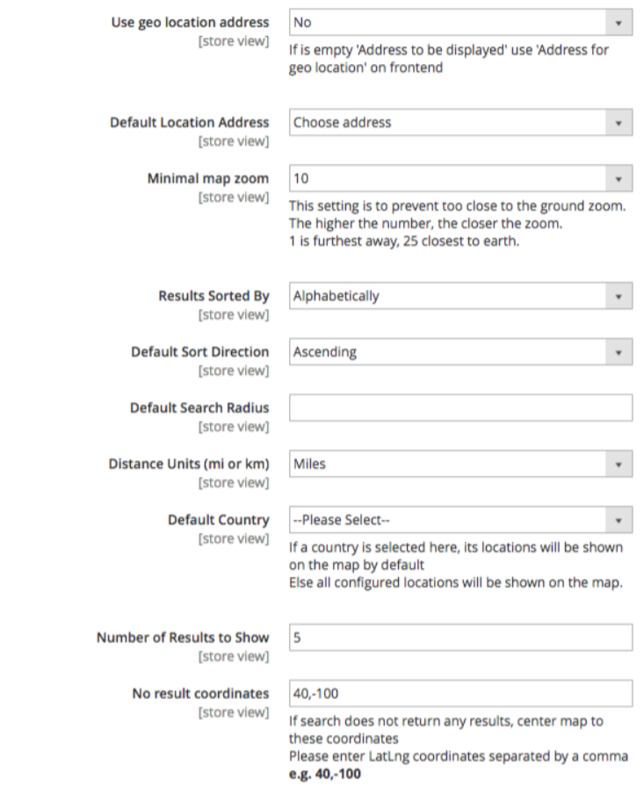 Then, assign a search radius option that will be used by default, select miles or kilometers for distance units, as well as a country for which initial map results will be shown. Also, enter the maximum number of search results displayed and coordinates for searches with no result. The next setting lets you import a CSV file with locations. In “Overwrite existing locations on import?”, select “No” if you want to keep existing locations and add imported ones to them or “Yes” if you want to remove old records. 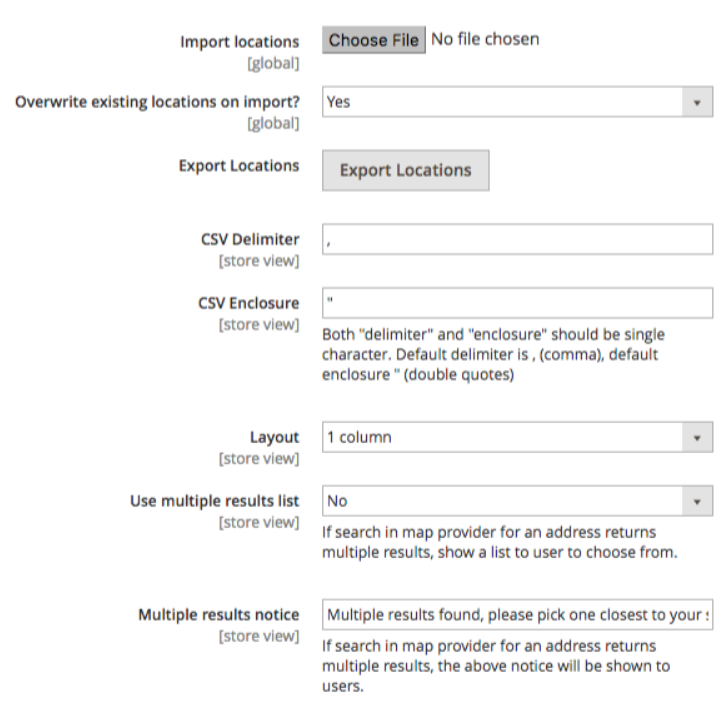 It is also possible to quickly export the locations you created in CSV by clicking the “Export Locations” button. “CSV Delimiter” and “CSV Enclosure” have default characters that you can change if necessary. You can also pick a layout of your map page, decide whether to use multiple results list, and specify a notice for the list displayed on the storefront. Now, let’s see how to create a new store location in the backend. 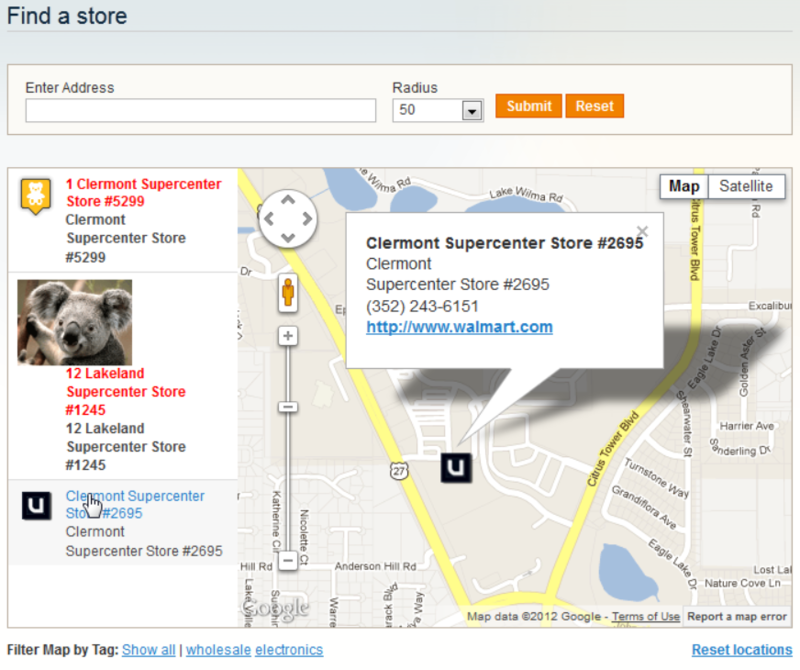 A new location page is divided into four sections: Store Location Info, Map settings, Geo Location, and Custom Fields. In the first tab, you should enter the name of a store in Title and enter the address as you want it to be displayed on the frontend. You can also add a phone number and website or email in the store description, and select on which stores it will be visible. You can also choose a particular country for the store. In the Store type field, add search tags related to your products or services that will be used for filtering store location results. Next, you can mark your offline store as featured to place it on the top of the search results regardless of other conditions. In Notes, you can enter additional information that will be displayed in the store description. In Map settings, you can upload an image to use as a custom icon instead of the Google default marker. If you use a default icon, decide whether to add sequential numbers to the marker. 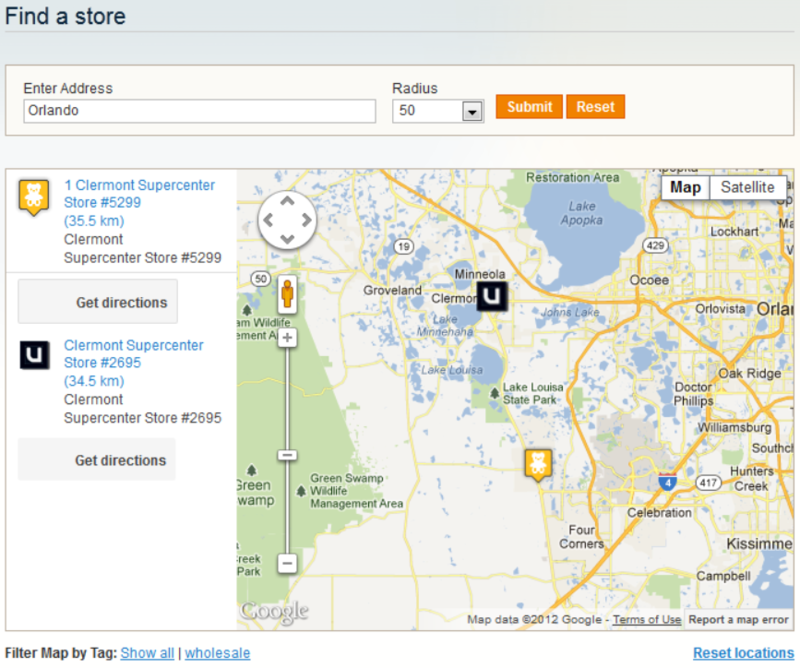 In the Geo Location tab, enter the physical address of your store to let Google calculate its actual geo position. 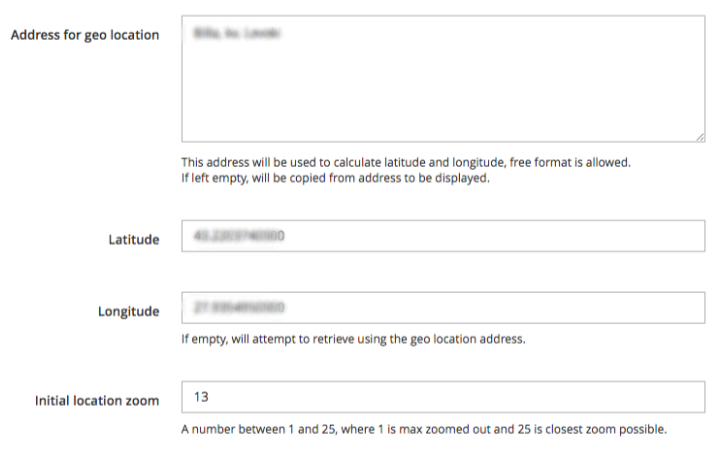 The values in Latitude and Longitude will be filled in automatically; otherwise, you can specify them manually. Also, type in a number for initial zoom on the location map. 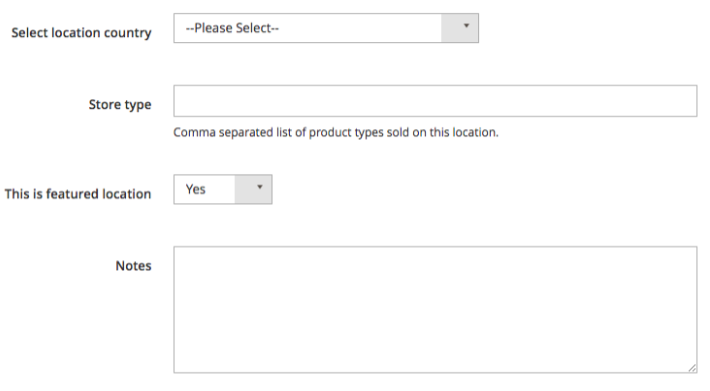 The last section allows you to add custom fields if required. Let’s have a look at how the map page looks on the frontend. At the top of the page, there is a search box where a customer can look for offline stores by address (country, city, region, etc.) and radius. Besides address, your website visitors can perform the search by name, zip code, and other parameters understandable by Google. The radius options appear in the drop-down according to the backend configuration. Search results are displayed in the left sidebar. If a user clicks on one of the listed stores, it will appear on the map with a pre-defined or default zoom according to backend configuration. A customer will also see a popup window that contains additional information, like a store name, address, contact details, and other. If you mark a location as featured, its title will be shown in red color and bold text. As for the map display, a customer can view it in a Google street or satellite mode. Another element of the map page is a footer that includes tags, “Show all”, and “Reset locations” buttons. By clicking on one of the tags, a user will narrow the search results. If a customer wants to go back to initial results, they should click the “Reset locations” button. 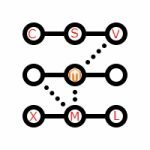 The Magento 2 Store Locator module allows finding directions to the selected offline store in the same way as with Google Maps. Under each location, there is the “Get directions” button. 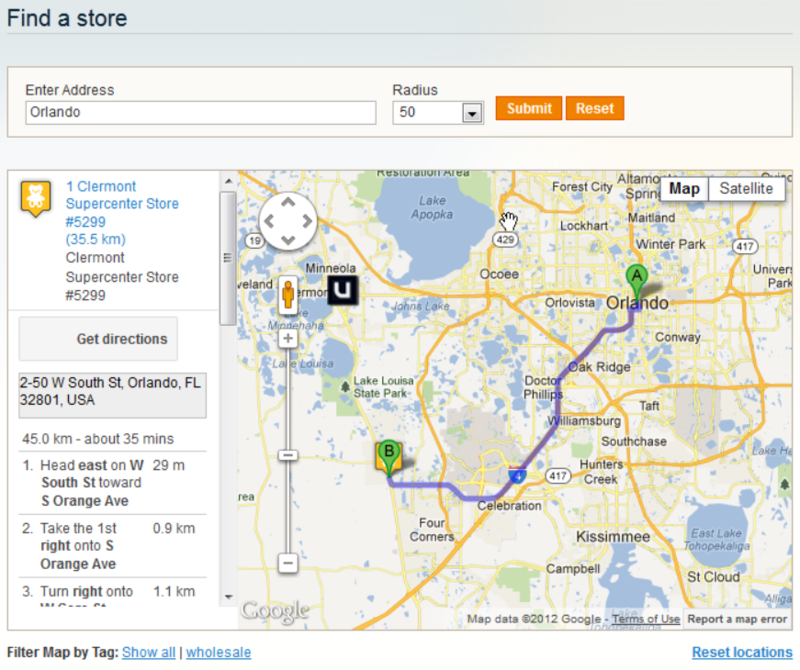 After clicking on the button, a user will see a route and turn-by-turn directions to the exact shop. Each step on the route can be shown in a closer view on the map. 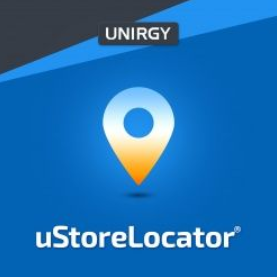 uStoreLocator for Magento 2 by Unirgy provides merchants who have brick-and-mortar shops with the tools for quick search of store locations on the interactive map. Possibility to look for physical stores and locate them on the map improves customer experience and increases loyalty to your business. Another advantage you get by installing the Store Locator module is a set of flexible settings letting you adjust various parameters of each store location and customize the frontend appearance of the map.